One of my goals in 2014 is to be more organized. Those of you who know me are probably shaking your heads. Thing is, you haven’t seen my bedroom or scraproom or healthy snack cupboard. 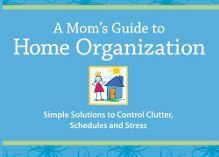 To help with that, US Family Guide clued me in on “A Mom’s Guide to Home Organization” and I am interested (for many reasons) to see what this book has to say. I’ll be reading it over the next few weeks and come back at you with a review. The book, available on Amazon, “walks you through simple processes and tips for organizing your time, your stuff and your space. The second half of the book addresses how to teach your children the life skill of being organized”. If you’ve seen my kids’ toy room, you know I need to read this. Have a room like this? I’ll keep you posted. Between this and one of my current personal endeavors, this should be a fun and easy task. 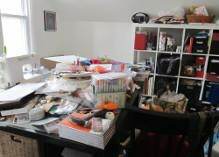 This entry was posted in Book Reviews and tagged home, organization. Bookmark the permalink. Looking forward to hearing if you find it useful! And great transformation on that playroom. We have quite few closets in need of organization around here!